This month I did something that I've probably criticized others for in the past: I bought a Filofax and turned right around and re-sold it. It was a crimson Malden. I've been on the lookout for one ever since, well, since they were discontinued to be honest. I'd seen photos of them online and thought, wow that just looks so nice. So when I found out Anita was selling hers, I jumped at the chance to buy it. I didn't think the Malden was going to change my life in any way. It would be a nice addition to my collection. But when I got it in my hands, I had to admit it wasn't what I expected to be. It didn't blow my socks off. To be honest I preferred my chili Cuban, and didn't see me ever actually using the Malden. So I sold it on to someone who I hope will give it the love it deserves. 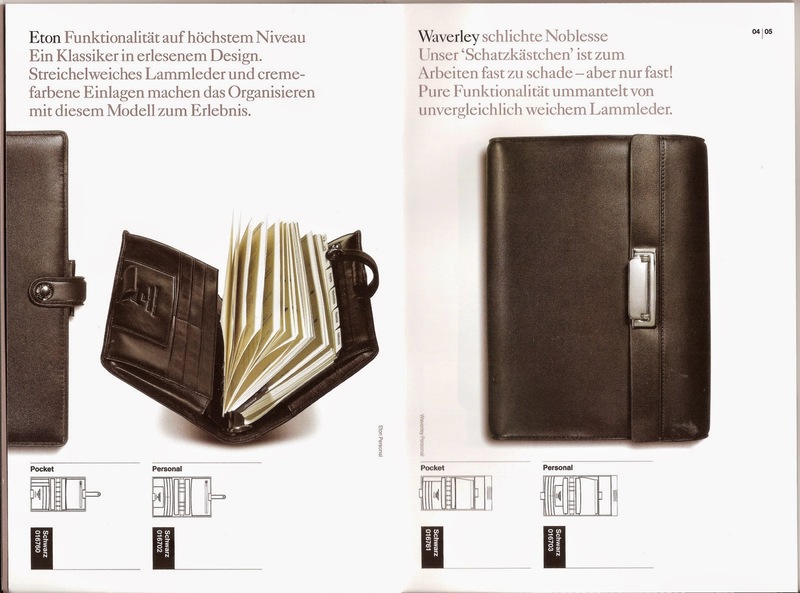 Have you ever bought a Filofax, then when you had it in your hands it just wasn't what you'd hoped it would be? What did you do? I'm sure there are quite a few readers that have tried out a variation on last years set up or a completely new set up compared to last year. My own set up is largely unchanged, but I'm always looking to improve it, a small tweak here or there to improve various aspects of it. It goes without saying that there is no universal set up that will work for everyone. We all lead different lives and we all put different demands on our organisers on a daily basis. What suits one person will not suit some one else. So if your set up is working well... leave it... don't change it just on a whim. But in the case of someone who is new to paper planning or their circumstances have changed and whilst you thought it was the perfect set up it might not be working quite as you expected. By all means change your set up in what ever way you need to to make it work..... but a word of caution.... don't make too many changes at once. Only change one thing at a time and give it may be two weeks before you decide if that change (what ever it was) is going to make your organiser work for you. 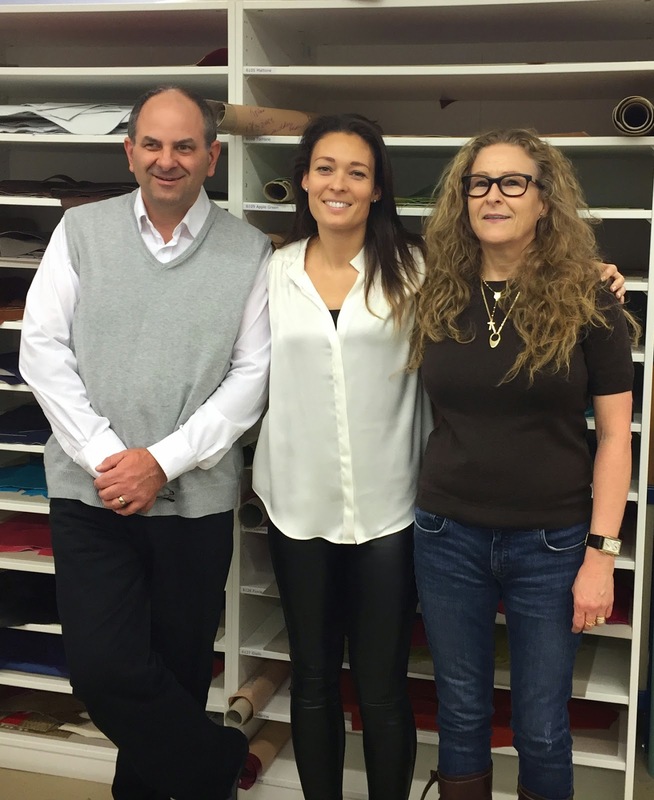 You might remember this picture from our visit to see Petra Van der Spek and the family in October last year. The eight other people we would like to join us again at the Van der Spek workshop in Puttershoek on Saturday 25th April 2015. Before you start reaching for your credit cards and a suitcase, please read all of this post. Firstly, places are limited to just 8 people, unfortunately due to the size of the workshop, this is why we have had to limit the numbers for this first 'group visit'. Hopefully there will be future meet ups, so if you miss out on this one there will be a chance again in future. We will open the mailbox for you to apply for a place on the meet up on Saturday 31st January, this is so you have some time between reading this and Saturday to check your diary, check the costs of travel and timings etc. There are full details about how to apply for a place at the end of this post. So here is the outline of the visit and details of what we aim to offer. People travelling some distance (like Janet and I) will be arriving in Rotterdam on Friday afternoon 24th April. Petra has negotiated a conference rate at the Tulip Inn Hotel in Rotterdam for attendees. However, you will be responsible for paying for your room which includes the cost of breakfast, but you will get the reduced rate, details will be included in the confirmation email you will receive if you are allocated a place. On the Friday evening for those people that arrived that day, we will meet up at the hotel and eat out in Rotterdam, possibly at Vapianos in Rotterdam. If that name sounds familiar, yes it is the same chain of restaurants as the ones we visit in London for the Philofaxy meet ups. The food is good and reasonably priced and you order using a simple smart card system and pay for just what you ordered. On Saturday morning following breakfast at the hotel we will travel together by public transport to Puttershoek aiming to get to the workshop by 10:30am. A factory ‘tour’/presentation of models, history of the company. Stopping for lunch may be at about 12:30-13:00 for say 45 minutes allowing people plenty of time to ‘mingle’ and chat with the others. Ring swapping demo by Steve! There will be a brain storming session looking at design ideas and any other feedback items on the Van der Spek website/customer service areas etc etc. 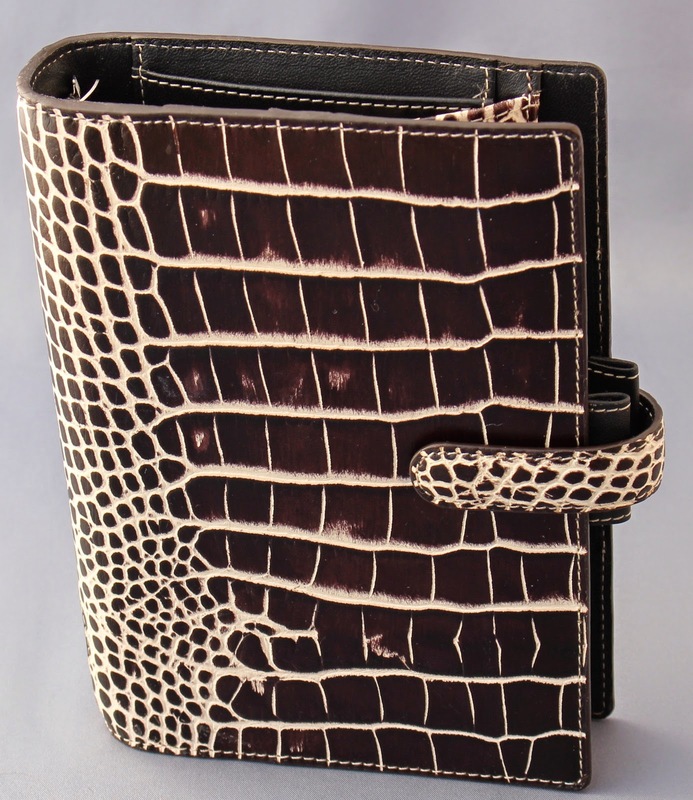 Design your own organiser on the day, with the chance to see the leather that will be used etc. Future organiser designs with thoughts and feedback from the group to Petra. If you are staying on in the hotel on the Saturday evening, we will once again go out as a group to eat, including the Van der Spek family. On the Sunday depending on our individual departure times there might be a possibility to look around the city before we travel home again. To be clear, each attendee will be responsible for the cost of their travel to Rotterdam and hotel costs, evening meals etc. However a buffet lunch will be provided on the Saturday at the workshop. 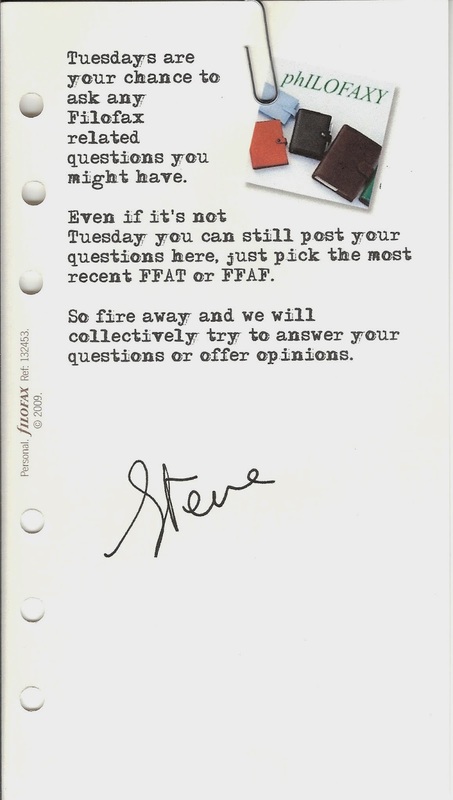 Steve will confirm you have a place within an hour of sending your email. The confirmation will contain further details about timings and booking the hotel etc. Once all places are allocated a reserve list will also be created in case there are any people that have to pull out of the meet up after being allocated a place. If you have any questions about the meet up please contact Steve at the above email address and he will respond as quickly as possible. 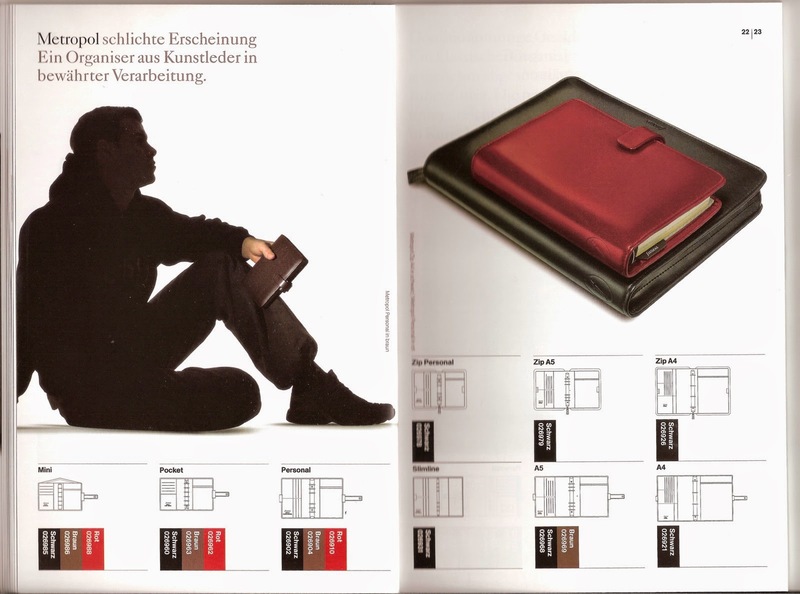 Today we go back a few years to the UK catalogue of 2010-11, it was the first Filofax catalogue I had seen since the 1980's... they had changed quite a bit! Today I would like to introduce you to Jane. Hi, I’m Jane and I live in Gloucestershire with my husband, Stuart, two of my three grown-up children, my boxer Gaby and two cats William and Millie. By day I am an Administrator with the local authority for a service working with early years children with special educational needs and [or] disabilities. By night I am a planner and stationery addict. I have had a love of all things paper and stationery since an early age. I remember being so disappointed at being given a toy till that I wrote letters above the keys as I really wanted a typewriter; also the best thing about a new school year was new exercise books for EVERY subject! My first organizer was a Microfile. I purchased this over twenty years ago; it was an A5 zipped style in green canvas with tan leather effect trim. 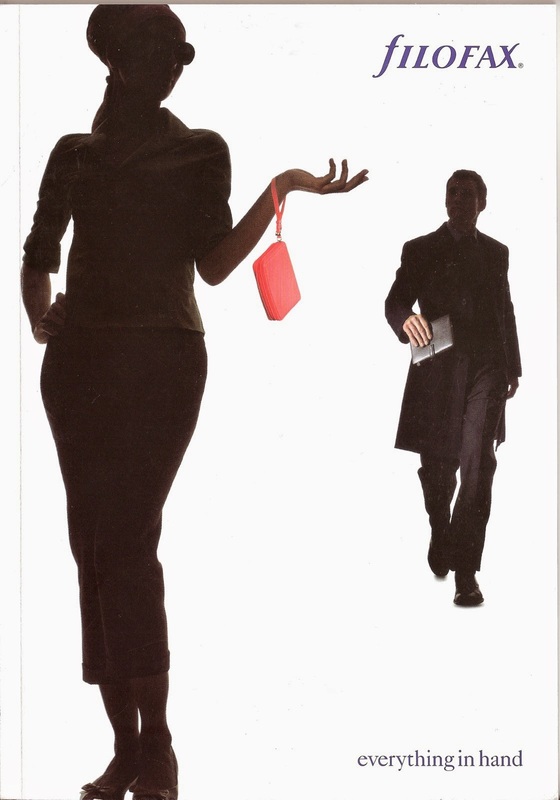 I used this for a while but didn’t really bond with its looks and so eventually bought a Filofax A5 Lyndhurst in black leather which was also a zipped style. I currently use a mixture of Filofax, Gillio and Van Der Spek organizers. Before discovering Gillio and Van Der Spek I thought about trying Franklin Covey, but despite deliberating over the catalogue I was never genuinely tempted. Sorry, I am going to have to choose two! My personal size Gillio Mia Cara and my Van Der Spek A5 custom. They are very different from each other and I also use them very differently. I see, confession time is it? I have nine Filofax, two Gillio and one Van Der Spek. I do also have various Maldens that I have put to one side to sell so am no longer classing these as mine – can I get away with that excuse? That would be the A5 Lyndhurst I mentioned earlier. My Gillio Mia Cara is my everyday planner – calendar, reminders, notes, shopping lists, tasks – my brain dumping place basically. My Van Der Spek A5 is what I call my “ME” planner; I’m trying to be more healthy so use this to record diet and lifestyle stuff, there’s a bit of journaling in there although not everyday. I have also recently started keeping a record of my dreams so that’s included too. I also have sections for learning the piano and Italian. I also use a Gillio pocket Compagna as a wallet, it’s actually one of the older Giliodoro styles. 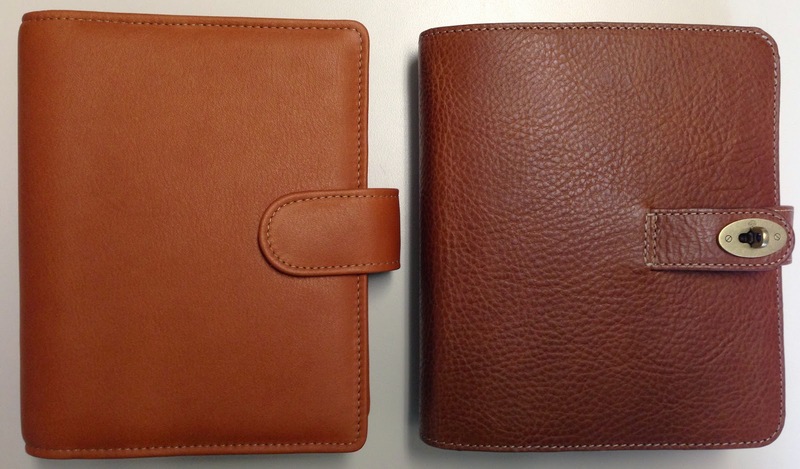 Finally, I use a trio of Apex at work – personal, A5 and A4 folio. With all the planners I use it has to be the flexibility of the ring system. Moving sections around, removing or adding as needed is so useful. Also, being a bit of a perfectionist, the ability to tear out a page when a mistake occurs! My perfect planner would be A5 with generous rings, beautiful leather which smells wonderful which is soft to handle but tough enough for life’s little knocks too. 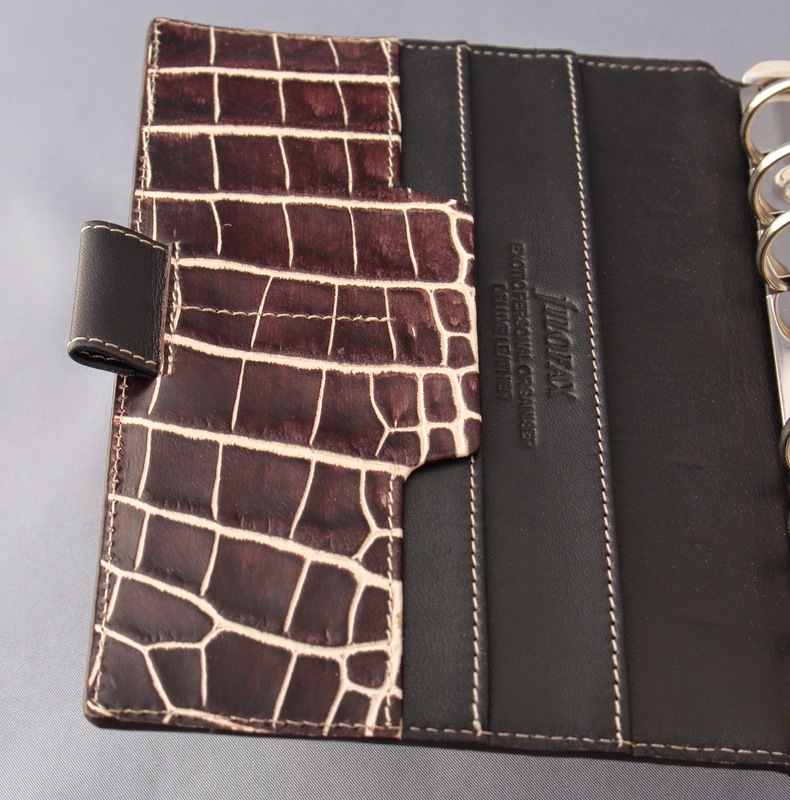 It would have just the right layout inside without the numerous card slots some planners seem to have. It would be neutral in colour on the outside concealing a beautiful array of colour on the inside – wait a minute, I’ve just described my custom Van Der Spek! My A5 stays at home so is only carried around by hand. The two Gillios just go inside whatever bag I am using at the time; other than keeping keys and liquids away from them I am not too precious – they are meant to be used. 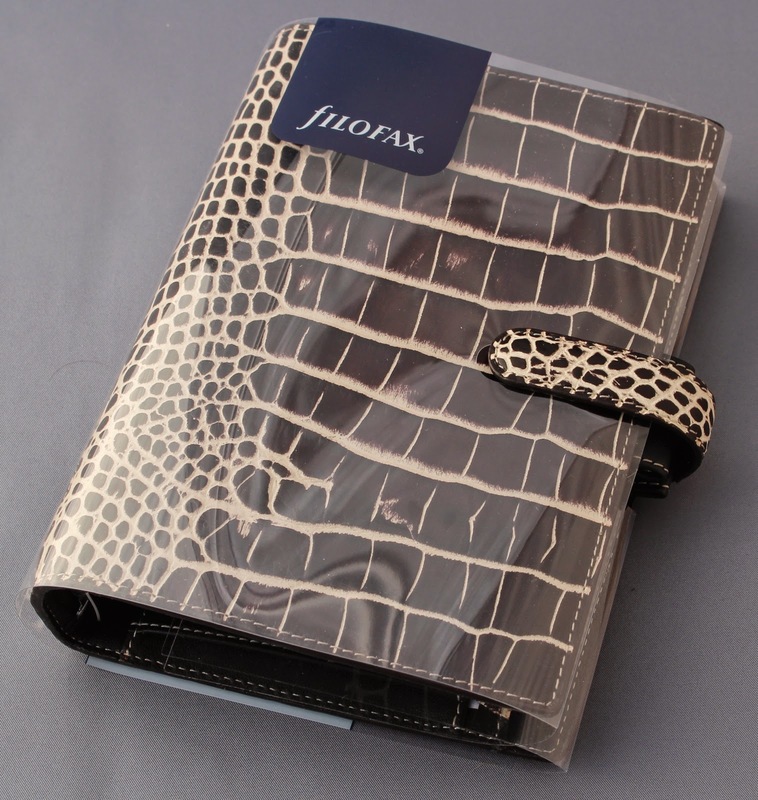 To be honest I am a little disappointed with the Filofax range of late. I do have plans for another custom A5 Van Der Spek later this year but for now I have planner peace with those I am currently using. It is my Gillio Mia Cara. My lips are sealed as to how much it cost, but it was preloved and I bought it from someone in the States so not only was it an expensive purchase I had customs charges to pay as well. I think the best tip I could offer would be to live with something for a while before deciding it’s not right for you. The wealth of information is amazing, whether you need to find the answer to a planner question or are just browsing it is so interesting. The community of people I have grown to know – who don’t look at me as though I have two heads because I still use a paper planner. But I think the one thing about Philofaxy that I would be lost without has to be the inserts. I have to say a major “thank you” to both Steve Morton and Ray Blake for the exceptional collection of inserts. I have tweaked the source documents provided and now have unique and perfect inserts. The easiest question to answer – nothing! It was so long ago I cannot remember! I use Spotify to create playlists so don’t tend to download anymore. Yes, I’ve been to a Philofaxy meet-up in London and also the Gillio “Think Tank” event that took place last year. Looking forward to hopefully attending more this year too. As I am currently suffering with the ‘flu and a chest infection I have become a bit of a couch potato so I’m afraid it was a chick-flick – “New Year’s Eve”. I am currently reading Marie Kondo’s “The Life-Changing Magic of Tidying”; a book that I expect will be familiar to a lot of Philofaxy readers. Definitely George Clooney – so long as he brings coffee! Thank you Jane. As you know we are constantly looking for new people to appear in our 'Reader Under Spotlight feature, you don't have to be 'well known' or a long term user to be considered to appear in this 'spot'. So please contact Steve philofaxy at gmail dot com today. Thank you. I am feeling an overwhelming urge to simplify things in my life right now. Unsurprisingly, my Filofaxes have come into the spotlight and I am considering downsizing to using and owning one personal size binder again. Thinking back, I think that I have been at my most content and productive with a sole filo. I recently read about the Power of 1 on Time Management Ninja and it just struck such a chord with me. As I'm sure you can understand, this means that my Filofax will need to tick all the boxes for my needs like layout, colour and design. I am glad to say that I have just received a new binder that I feel meets everything (more details in another post), so I am looking forward to finding new homes for the rest. And as it's Friday, please feel free to discuss anything ring-binder related. Have a great weekend. Printing of any inserts or pages often causes lots of people problems, wasted paper, increased stress levels, the list goes on. But with a bit of thinking and a bit of practice it is actually quite straight forward. A6 paper is 148mm by 105mm (5.827 x 4.134 inches) I think it's easier to measure accurately in mm! 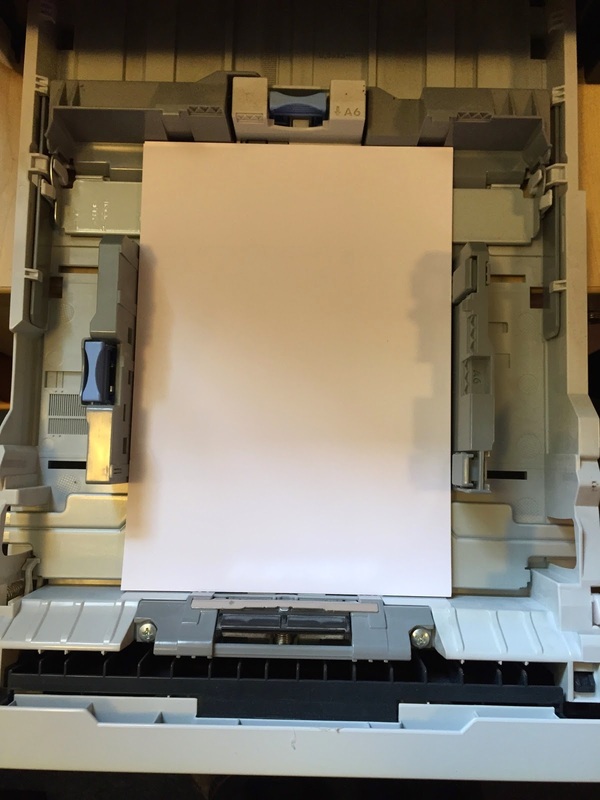 How you approach printing your inserts will naturally depend on what printer you have and what paper feed arrangements it has. Not all printers can handle paper as small as A6. That said I was surprised to discover that our HP Laserjet printer can print from the paper tray not just the manual paper insert tray. OK let's step back for a second. 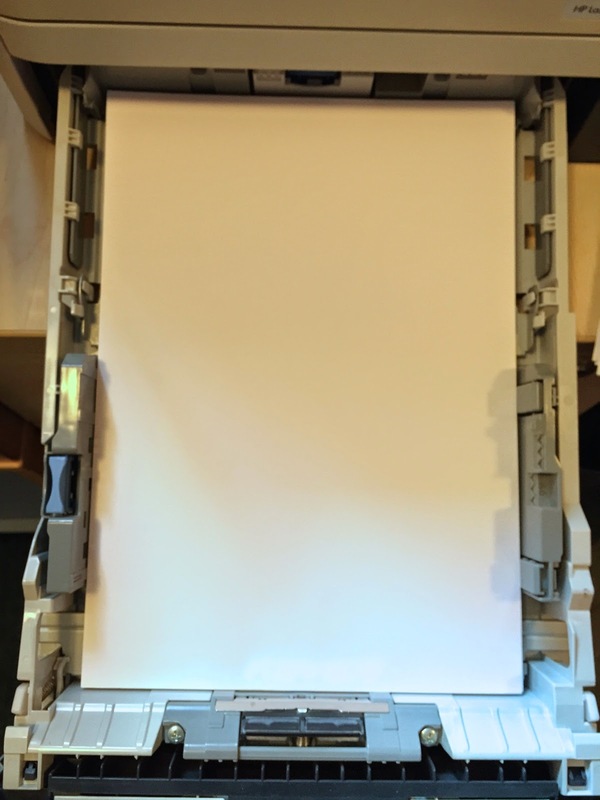 Open the paper tray on your printer if it has one and what do you see? So the paper is held in place by moveable 'side cheeks' and a moveable 'end stop' They normally have markers as to where to move them to. So with the A4 paper removed I first of all wanted to print some A5 pages to show you. So I moved the side cheeks in and the end stop to the A5 location and then printed off the pages. First one side then the other. Which way the paper feeds will depend on the printer. In my case the 'head' or top of the page is at the front of the paper tray or the bottom of the picture in this case and the side to be printed is face down in the tray. So the paper does an S shape through the printer to then come out face down in the output tray. I have been seeing an increasing number of people using A6 size organisers. Why A6, well as you saw from Alan Marshall's excellent tutorial on paper sizes A6 is in the same proportions to A5 and A4 paper. A6 size paper is 105mm by 148 mm which is half the size of A5 paper (148x210 mm) or a quarter of A4 paper (210x297 mm). This is obviously very convenient from a design point of view and printing too. 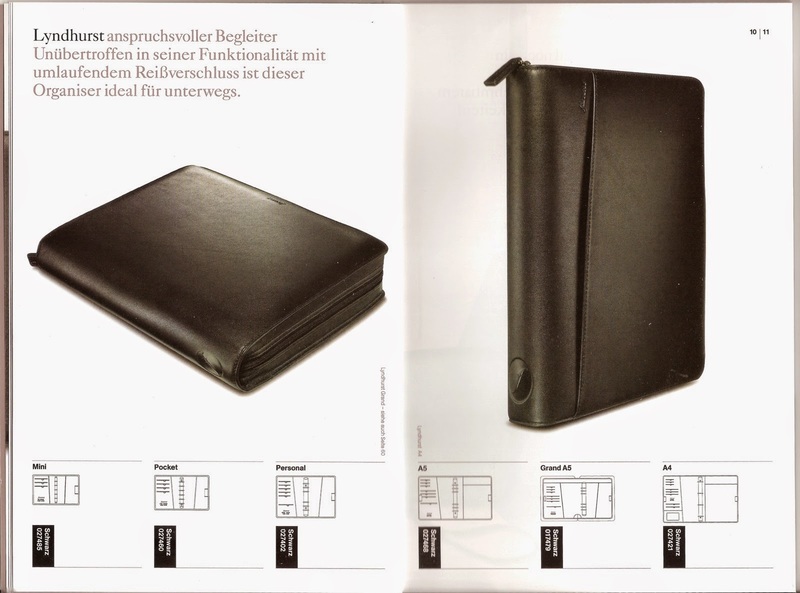 I will be covering how to print A6 inserts in another post, it is even easier to do that printing Filofax personal size. 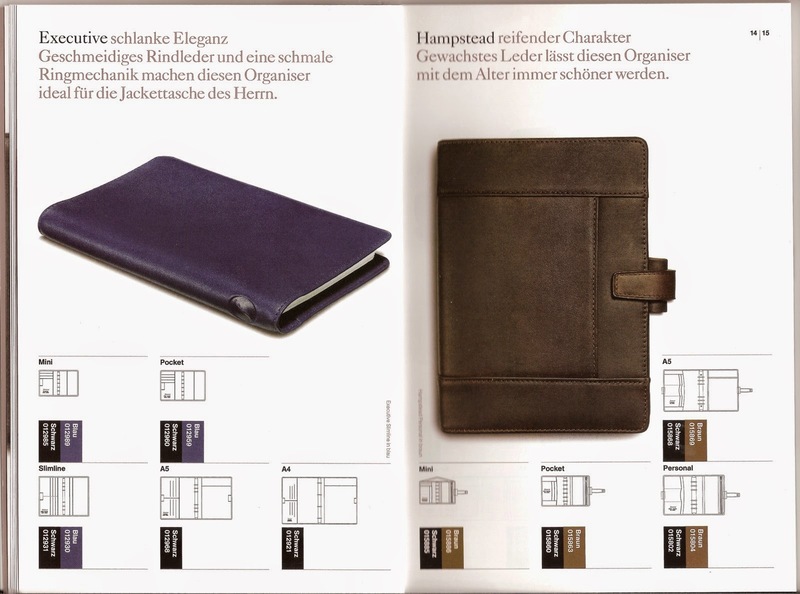 Van der Spek Senior and Mulberry Agenda. Thank you to Yvonne for the photo. Most of the recent ones I have seen have been Van der Spek Senior size, these will soon be available with 25 mm rings so quite an attractive option and a reasonable price compared to the limited range from Mulberry. Filofax have never as far as I know made an A6 size organiser. 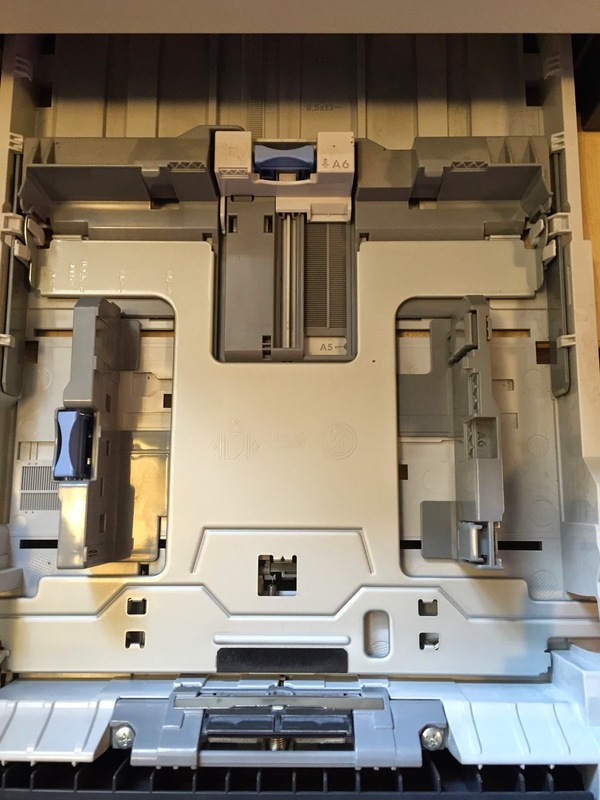 And if you are creating your own inserts, the good news is the Rapseco 6 hole punch has intermediate setting that matches this configuration between 'Pocket' and 'Personal'' The KW-Trio A5 punch and variants also have this '38 mm centre spacing' setting too. If you are creating your own inserts you can of course design them in A6 size. Personally I tend to design in A4 size and then scale them down at printing time. All the printed fonts all be reduced in size so it is easier to work at A4 size because that is most probably the size you are used to working in. The inserts that Ray and I make available are designed in A4 size and they will scale down to A6 easily. So there are no shortage of dairy inserts available for the A6 size. I will show you tomorrow how to easily print A6 size inserts on your own printer. Have you ever considered using an A6 size organiser instead of Personal size? 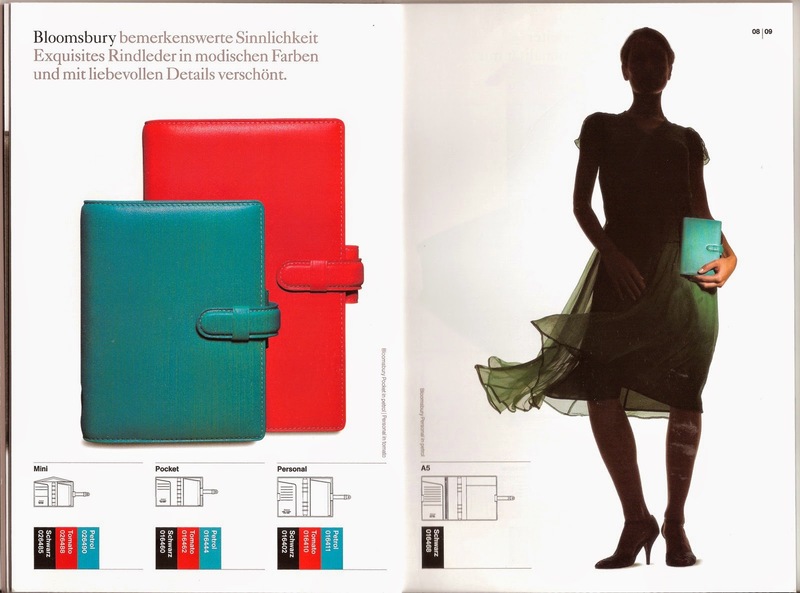 This week we look at the Filofax Germany catalogue from 2005/6. I live in Peterborough with my husband and two children Summer 4 and Bubba 3, they both have their own planners Summer has a personal pink Apex and Bubba a blue Moleskin notepad. We gather on a Saturday morning and decorate our pages over breakfast. I’m a Conference Receptionist and have a small paper craft business making Paper Flowers. I have used a diary my whole working life and have always had a thing for pens, inherited from my dad who has a great collection. I have always used diary’s and the year of my first bonus in 2008 I purchased a personal Siena in Cinnamon. I had been eyeing her up for a few months and she is still today something I look at with pride. I have used Franklin Coveys, Kikki.k, Kate Spade, Erin Condren Life Planner, Day Timers and a few novelty planners such as Marvel Comics, Timberland and an Aristocats Disney planner. Im currently trying a travelers notebook style planner with DIYFish inserts for 2015. My all-time favourite will always be my Siena closely followed by my Personal Vintage Pink Malden and Green Kate Spade Wellesley Zip. I own 60 organisers all together. My Siena although I am on the lookout for a Red Portland. I use 3 on a daily basis. A personal for my daily diary, apps and family related tasks, an A5 for work and another A5 for my little paper craft business. I like that you can personalize them and add to them, my dad always refers to the new laptop advert where one girl has a planner the other a laptop and he jokes I should ‘get with the times’ but I love the written form, I spend a lot of time watching setup videos and browsing IG and Pinterest admiring peoples layouts and it just makes me happy. A Divider with a pen loop – like in the flex so you could move it about. I throw it in my handbag – Every planner I use takes a good old battering, non are treated any different. If it can’t survive that I’m not interested. The Originals – I have most of them and the last one I purchased was the Gold but she had bad rings and had to be returned, unfortunately they were out of stock so she was never replaced. She is on my Wish List. My Siena was not cheap but I cannot remember how much I paid for her. Recently I spent £90 for an Aqua Personal Malden, a planner I had wanted for a fair while. Make it your own – I see many people saying I want mine set up like this persons or that persons but to be honest your planner has to work for you and you only. Also never forget the point of it, it’s to keep you organised as soon as it’s not doing that for you start again. I like that everytime I have a look through it I find a new article/blog or snippet of information. The detail that goes into Philofaxy is amazing. I can always find something new to read or browse. No but I attended a planner meet up recently through a facebook group and we had great fun, it was only four of us and I now have made local planner friends to geek out with. I would love to attend a Philofaxy one. War of The Worlds (Tom Cruise Version for the 100th time) I have a thing for apocalyptic films. 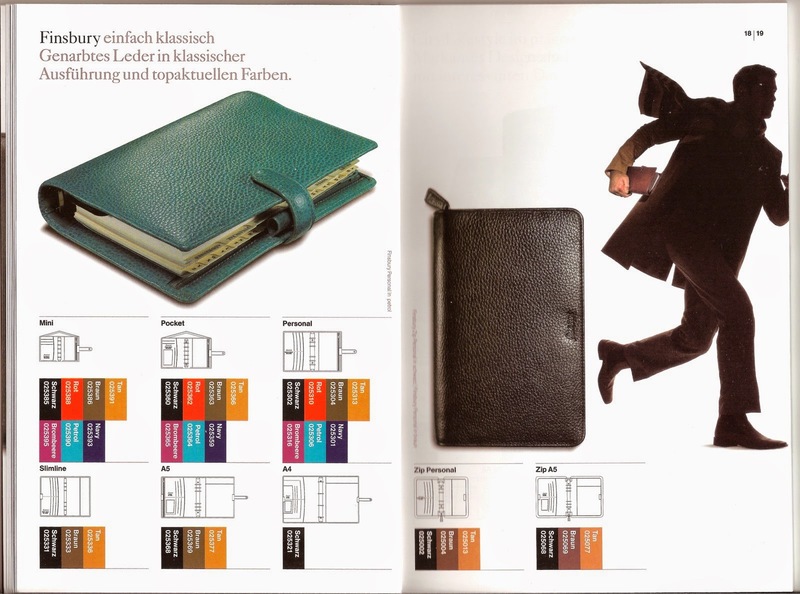 Before we go and through this weeks Web Finds I have of course to announce the winner of the Filofax Exotic Personal featured this week, kindly donated by Appelboom Pens. So we generated a random number between 1 and 93 (the number of comments received by mid-night on Friday). And the number 24 came up... I then counted the comment emails from 1 to 24 and it wasn't me.... so it was a valid winner! Who is...... Rita Sedani, Congratulations to Rita. Please contact me with your mailing address and we will get the organiser in the post to you. So two weeks in to the New Year, what is working in your 'new' set up if you have changed and what isn't working? Or if you kept the same set up, what do you think could work better may be? However, it is Friday so feel free to throw in any topical comments for discussion. This post has been a looooooong time coming. First up, I don’t know exactly how I got lost in my obsession for planners, and everything planner related. However, I do know that it started in October when I was in Japan. I guess being overseas gives you time to think about things, and I was thinking about things I needed to do when I got home. This led to thinking about how to plan said things, which lead to thinking how I don’t like using my iPhone calendar anymore as I am sick of reminders constantly going off and I never do what they reminding me of. I was at the point where I was ready to start planning my life properly. I was already in the process of moving away from using my iPhone calendar and going back to an old school paper and pen diary to plan my personal life and blog posts. However, it was heavy to carry around, and I still wasn’t using it properly. 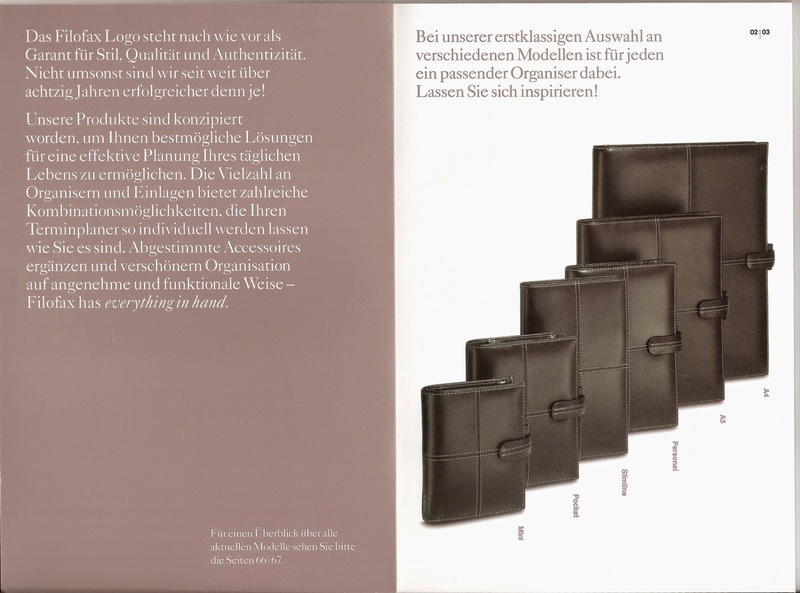 So all this thinking led to research, which led to learning about how people plan, which led to the wide, wide world of Filofax love and decoration, which led to writing a post about planning to plan. So now it’s finally time to move forward from the planning to the actual doing. 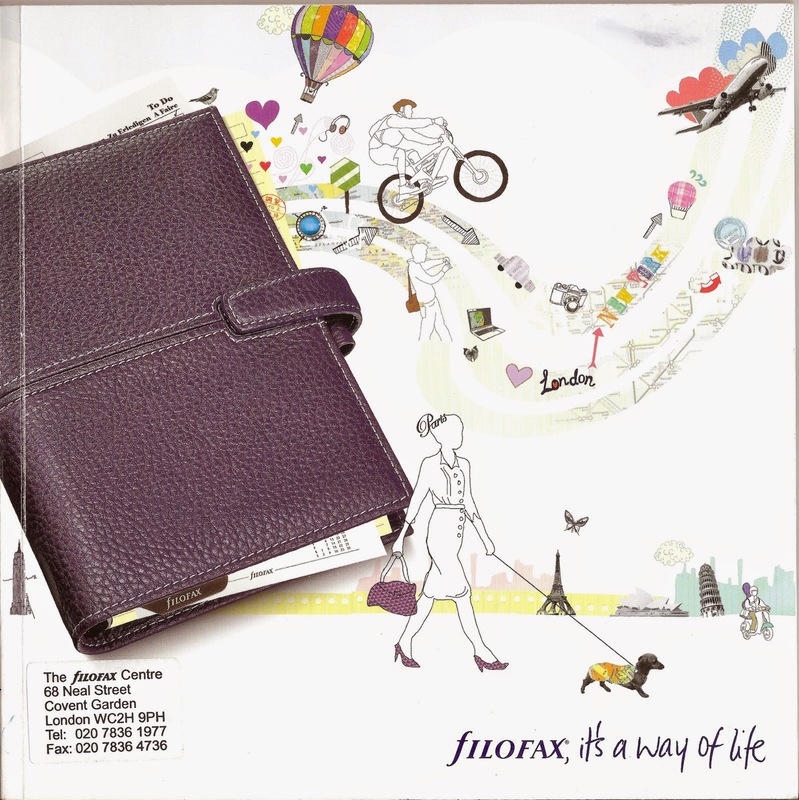 After frantically looking for a planner in Japan to no avail, I ordered a Filofax A5 Calipso organiser in purple on Amazon. After watching many YouTube videos, reading blog posts, and looking at Filofax communities, I’ve finally started to set my planner up. My Filofax has six card sleeves and a pouch at the front, and a zipped pouch at the back. 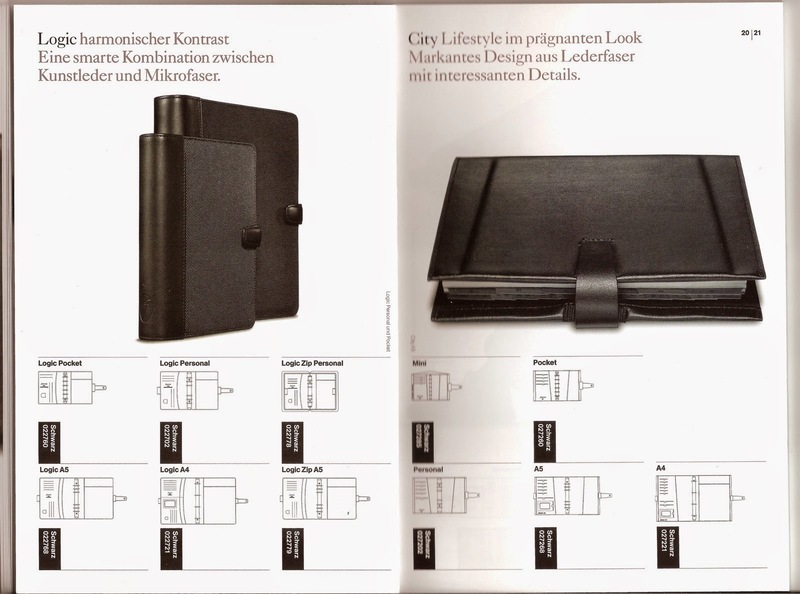 The only section I use is the pouch at the front, which holds my calendar legend (shown in the image below and discussed in detail later) and bills. I don’t think I’ll use the other sections as I don’t want to add too much bulk to my planner. This is the first thing you see when you open my planner. It’s something that I saw a lot of when I was doing research on how to set my planner up. I don’t intend on using any of the items on my dashboard, they’re basically there to pretty my planner up. At this stage I have five categories or areas that I’ll be using my planner for. Each category is identified by decorative scrapbook paper, which I cut to size and have inserted into an A5 plastic sleeve. Below are the categories that I have. I already have the feeling that some will be replaced with something else, which I’ll work out once I start using my planner properly. The inserts are from Kikki K and are a month to a page and a week to two pages. I use the month page to plot out blog posts, and the weekly pages to show what’s happening each day. I colour code each area that needs to be put on my weekly pages, the legend detailing the colours is stored in the pouch at the front of my planner, and can be seen on the image of the dashboard. 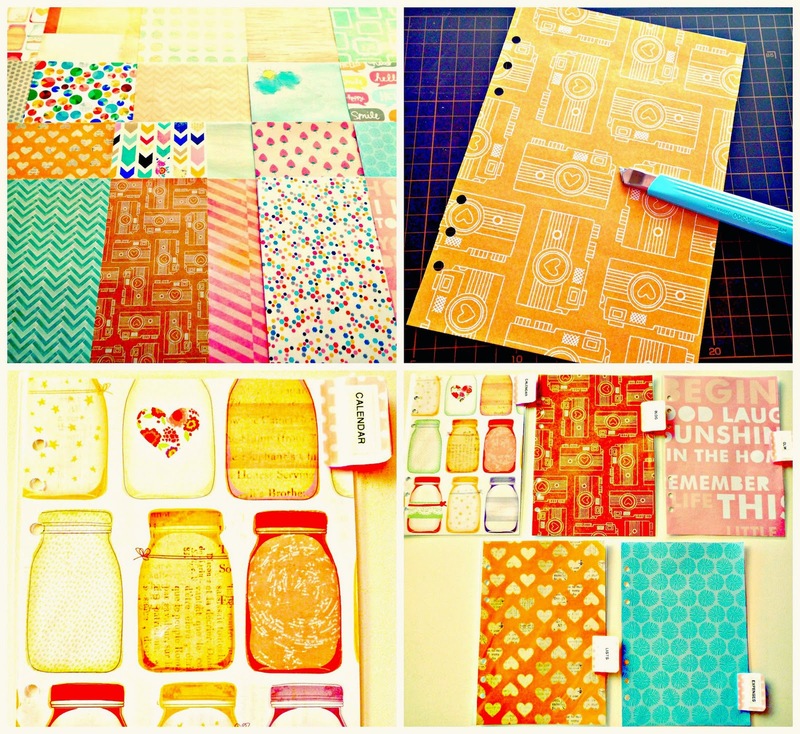 When I put something on my weekly pages I use washi tape in the corresponding colour instead of writing them in pen. As I’m always rescheduling things it’s much neater to move things around when they’re on washi tape, as opposed to crossing it out if they’re written in pen. There is the occasional thing that I may write in pen, but this doesn’t happen often. I will use this section to write down any blog post ideas that I have, or to store any magazine inspiration that I find. OLW stands for one little word, which is how I set goals for my year. If you’d like to learn more about this please click here. This year my one little word is focus. I intend to use this section to write down my focus goals, and write down anything focus orientated that will keep me inspired. I have already made an insert with my focus goals on it, which will always be in my current weekly page. You can view this in the image below. I’m crazy for lists, so this section will definitely stay. Each list has items on it that need doing. For example, some of the things on my garden list include plant herbs, work on shed path, and mulch side of house. Eventually everything on each of list will be transferred to my weekly calendar and ticked off the list. New things will be added to each list as they come up. This year one of my one little word goals is to focus on being financially responsible. I’m hoping to track my expenses in this section to allow me to do this. A big part of the Filofax community is planner decoration, which is not only fun, but also keeps you motivated to actually use your planner. I’m hoping to get better at this, and will be posting each month on what I have done for that month in terms of decoration. I’ll also show weekly photos of this on my Instagram account. In the meantime, I’d love to hear how you plan out your days. Thank you Lisa for your guest post, we really appreciate people sharing posts like this on Philofaxy. 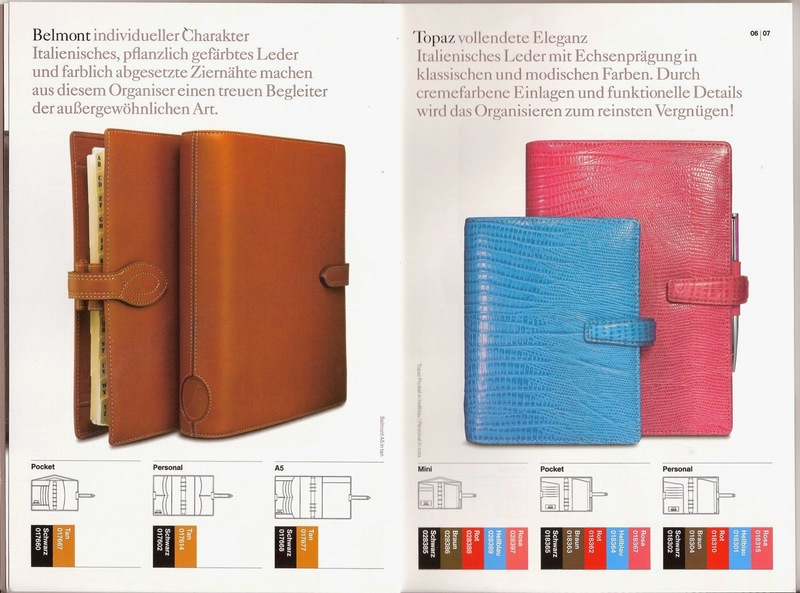 Filofax recently released a limited edition in personal and compact size called the Exotic. Philofaxy was very lucky to be sent a Personal size Exotic to review and giveaway by our friends at Appelboom in the Netherlands. 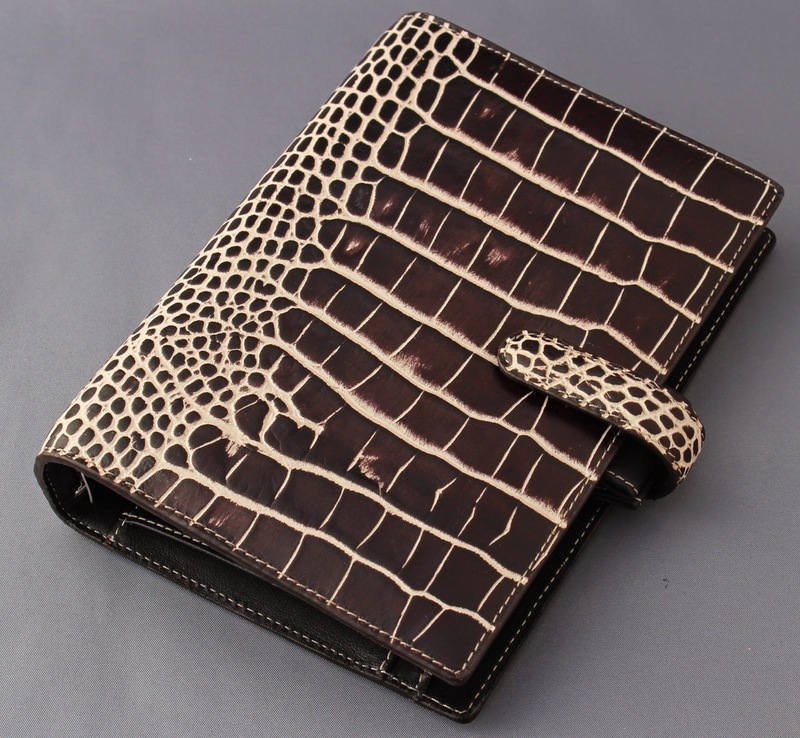 Vintage inspired and exquisitely hand finished, the Exotic Organiser is made from Italian crocodile print deluxe leather. 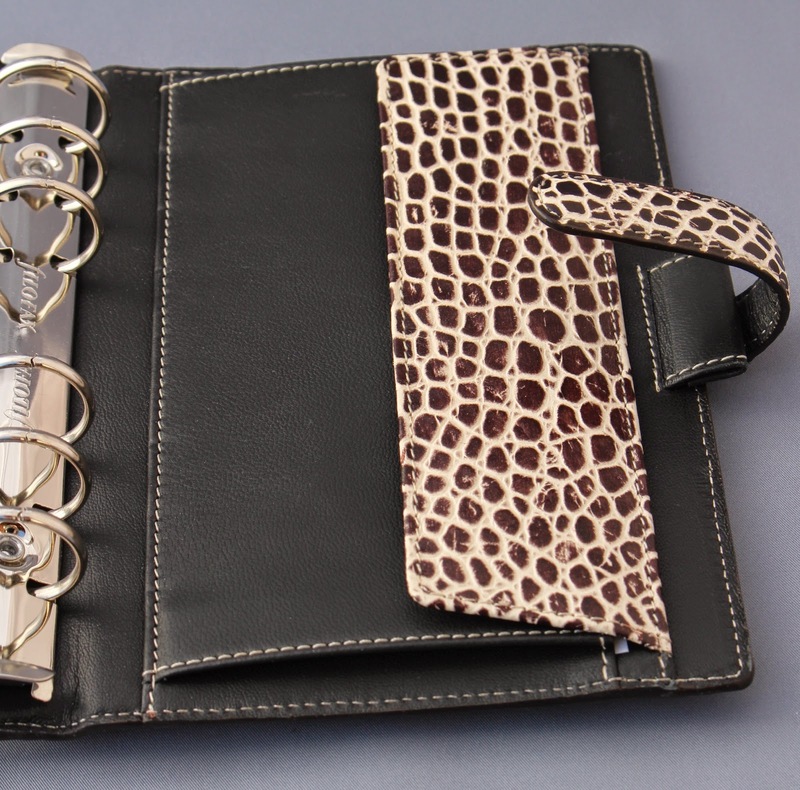 This stylish Personal organiser features internal pockets, pen holders and an expandable full height pocket with leather closure. So we will take a detailed look at this new model. The organiser is wrapped in the now typical clear plastic wrapper, which of course is easily removed. The inserts are in cotton cream. 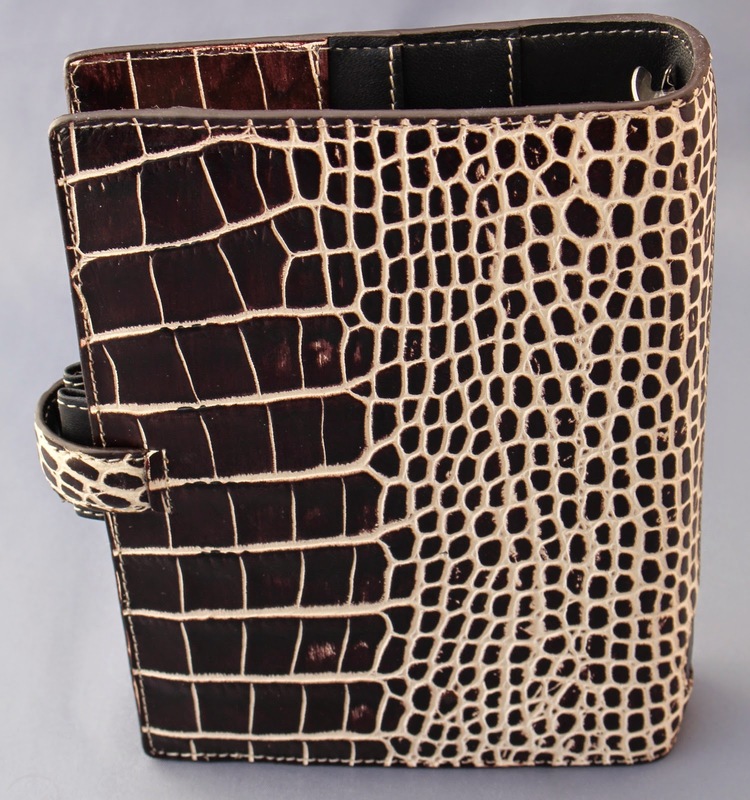 So without the wrapper you can see the detail of the crocodile print leather, which has a soft sheen to it. The pattern continues around the spine where there is a straight seam and the traditional 'f' at the base of the spine. The back cover has a similar pattern to the front. Opening it up it doesn't quite lay flat out of the box, but it might soften up with age. 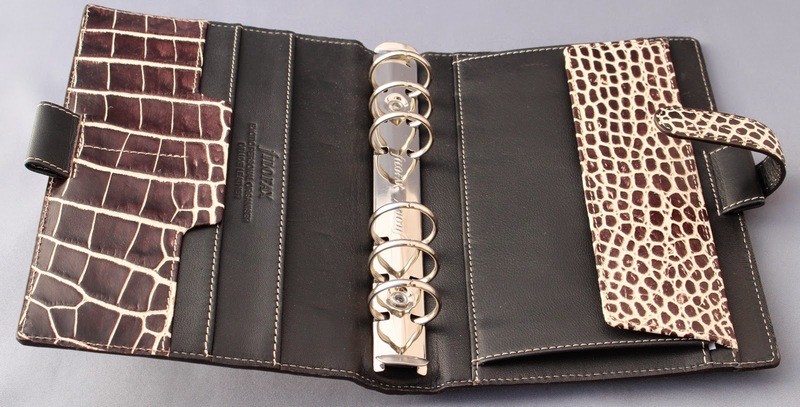 The organiser is fitted with 23 mm internal diameter rings. 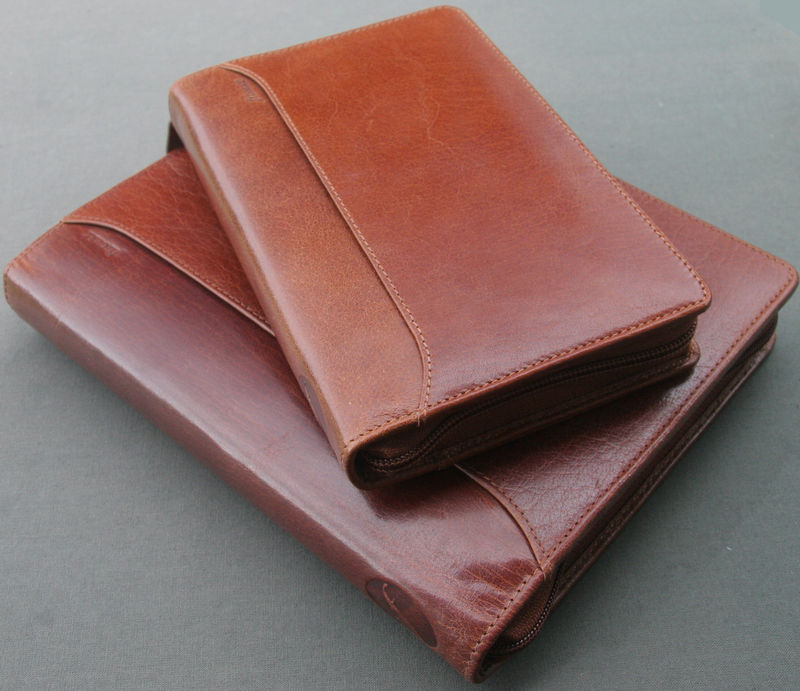 On the inside front cover we find the first of two pen loops these are leather elasticated ones. 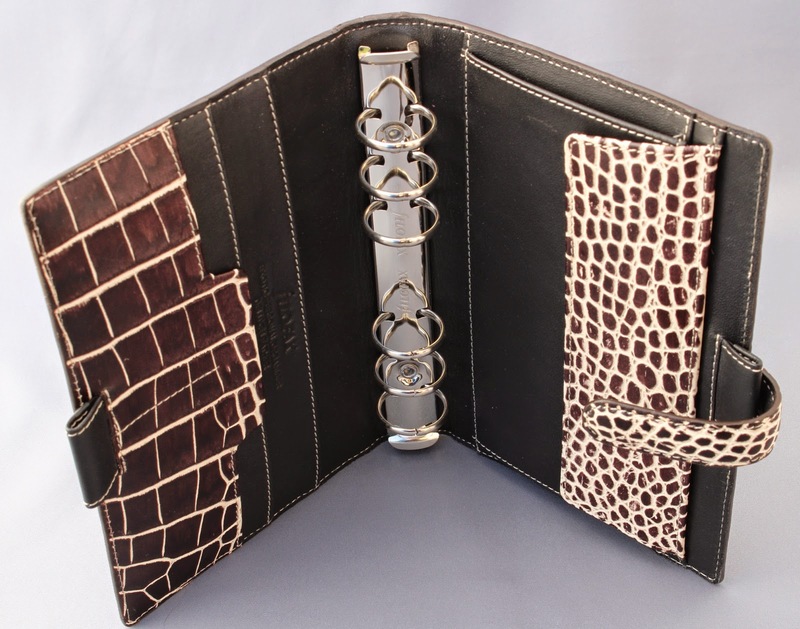 There are four vertical card slots as well as a full height slip pocket behind this section. You will notice the patterned leather is complemented by plain brown lambs leather on the interior. On the inside back pocket there is an expanding flap covered pocket all in leather of course. And the second of the two pen loops, like the other it is in leather and it is elasticated. Here we see a slightly different view of the interior of the Exotic. 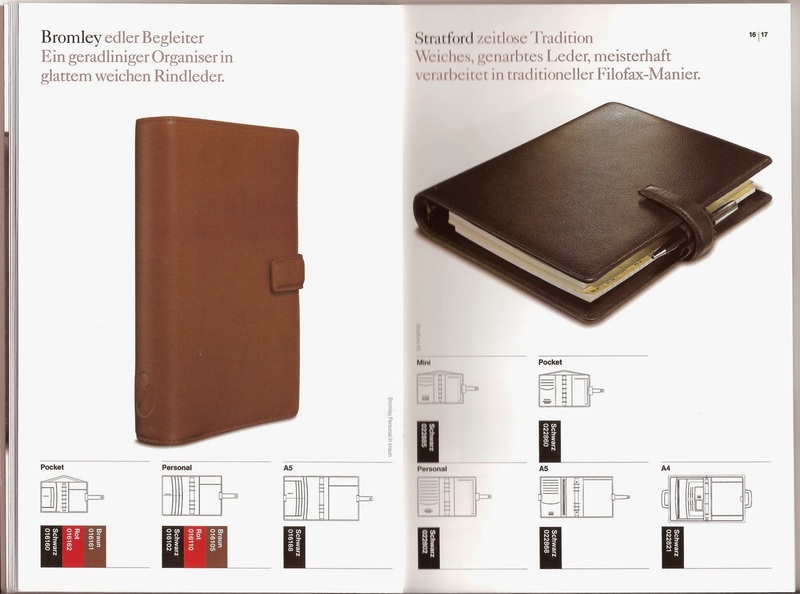 It is really good to see Filofax fitting two pen loops to a personal size organiser again. I hope we see this in other new models. I know a lot of people have asked for this additional pen loop. and another of the compact size which you will see is of a different design, but the same price. 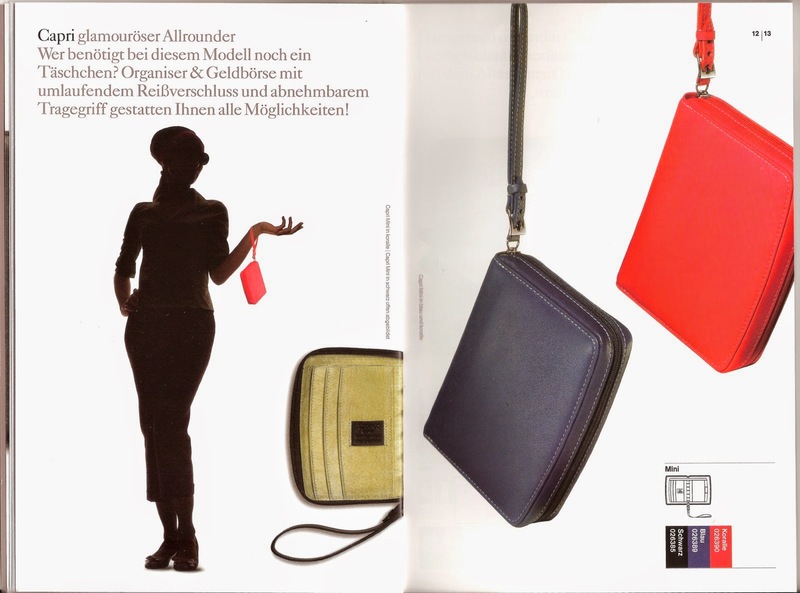 On the Compact model, instead of a clasp it has a large flap and popper. There is an outside zipped pocket in the back cover. And an additional a full height pocket behind the flap pocket accessed from the outside edge. There is only a single elasticated pen loop on the compact model and in common with other compact models the ring size is reduced to 15 mm internal diameter. Once again thank you to Joost Appelboom for supplying the review sample. Would you like to own the Personal size Exotic shown in this post? You would.... leave a comment below this post and we will put the names in to a hat and make the draw on Friday 16th January. The usual rules will apply... no cash alternative, the judges decision will be final, you must contact Steve within 48 hours of the announcement of the winner to receive this prize. Competition now closed... The Winner has been decided... find out who it is tomorrow in Web Finds.